Missed the Apple event? Read our Yahoo Tech team live coverage below for the full recap! 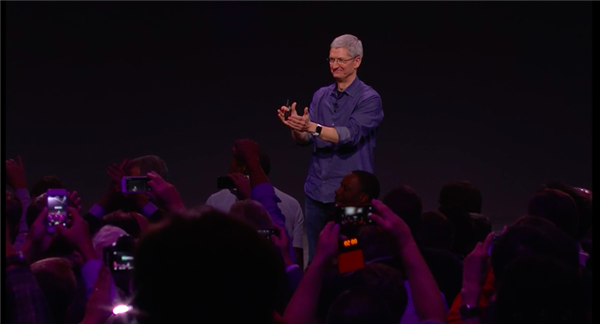 Apple announces two new iPhones: The iPhone 6 and the iPhone 6 Plus. The iPhone 6 has a 4.7-inch screen, and the iPhone 6 Plus has a 5.5-inch screen. The iPhone 5s, for comparison, had a 4.0-inch screen. The iPhone 6 will cost $199 for a 16GB and will be available on September 19th. The iPhone 6 Plus starts at $299 for a 16GB phone and will also be available on September 19th. iOS 8 will be available as a free download on September 17th. 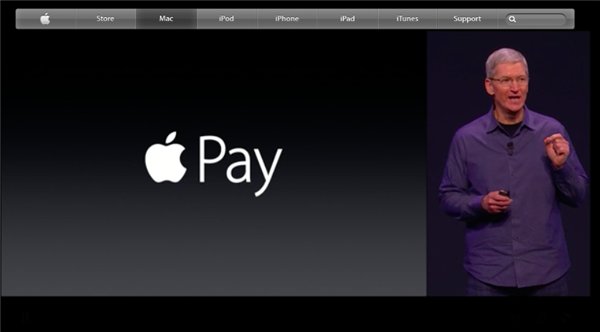 Apple also announces Apple Pay, a new system to let you pay at the register by tapping your iPhone. 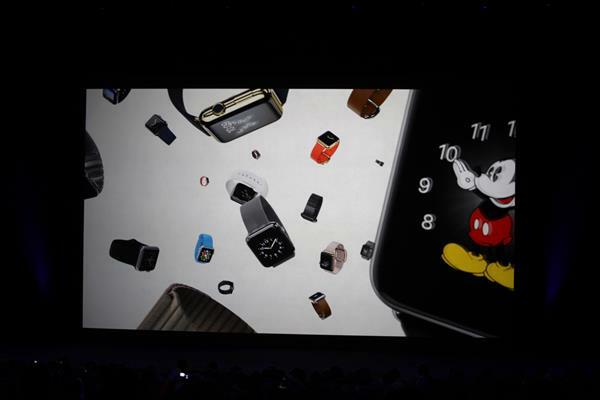 And finally: Apple announces the Apple Watch, with a new control system from the watch's dial or "crown." You'll be able to send messages, talk to Siri, listen to music, and check your pulse; it can also track your daily activity. It will cost $349. This thing is slithering around in a video. It is indeed an iWatch. I would definitely wear this thing. It's beautiful. They're flying around on screen now. In different colors. Some look like rubber bands, others metal chain. 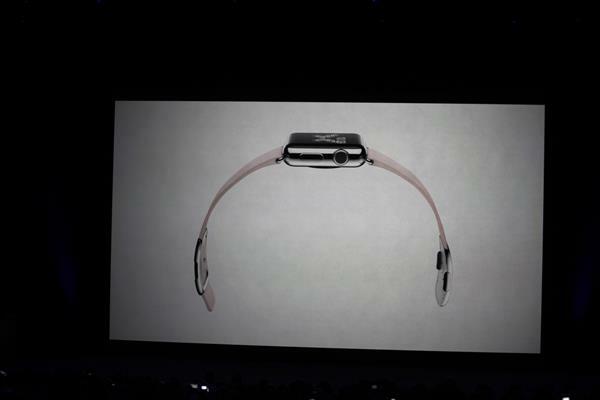 The iWatch is shiny metal; swappable bands. Choice of finishes. Sapphire crystal. The question is--how easily does drool wipe off of it? 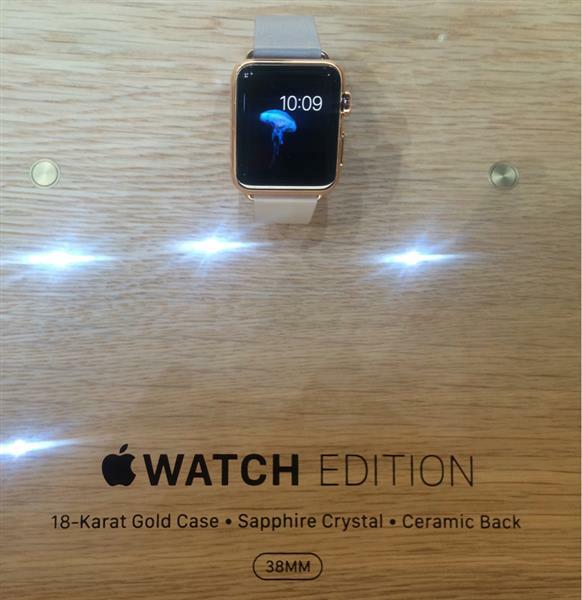 Oh, sorry--they're calling it the Apple Watch, not the iWatch. Crowd is coming to its feet. This is insane. 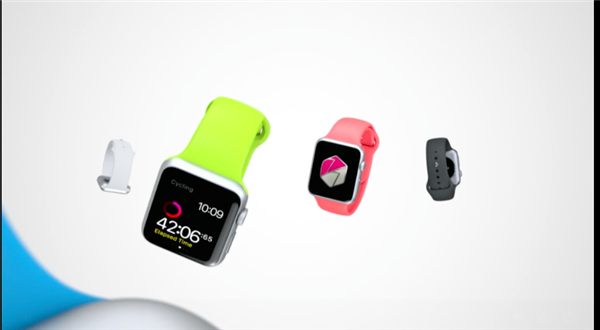 The Apple Watch is wirelessly accurate to within +/- 50 milliseconds. Maybe meetings will start on time now, for god's sake. They're calling it Apple Watch. Not iWatch. 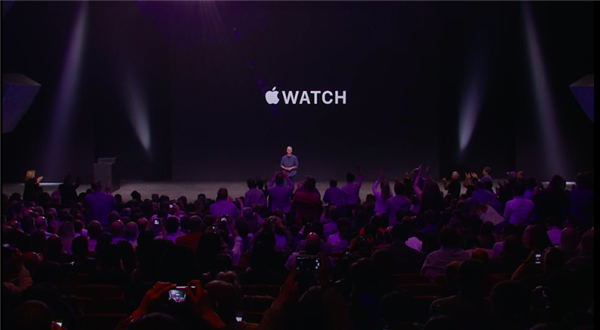 Cook: "We set out to make the best watch in the world. It's precise, synced to the internet, accurate to within 50 milliseconds." "Also a comprehensive health and fitness device." The problem with smartwatches has always been WHY? One answer: As a health/fitness monitor. Apple is playing that one right with the iWatch. iPod had click wheel. iPhone had touchscreen. What about the watch? Say brainwaves! Say brainwaves! Says, it's a comprehensive health and fitness device. "What we didn't do is take the iPhone user interface and strap in on your wrist." For example, pinch to zoom "just doesn't work." Cook is making fun of the "pinch to zoom" feature on smartwatches. So there's a DIAL, or a watch crown. On Apple, it's the "digital crown." It has an IR sensor. It's a simple and elegant and amazing input and navigation device. 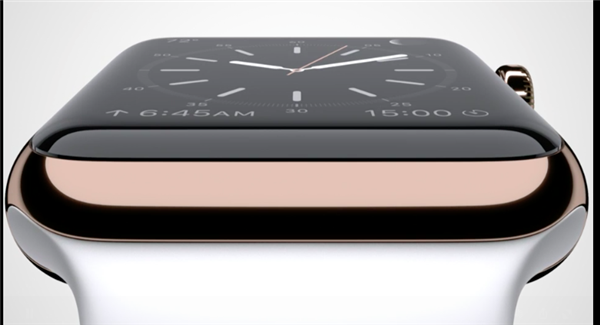 The watch is absolutely beautiful--they're CRYING over at Pebble--but it's kinda thick and chunky. Oh this crown is cool. So obvious. Press the crown to go to home screen. On Apple Watch you can turn the digital crown to zoom in and out on a Map. 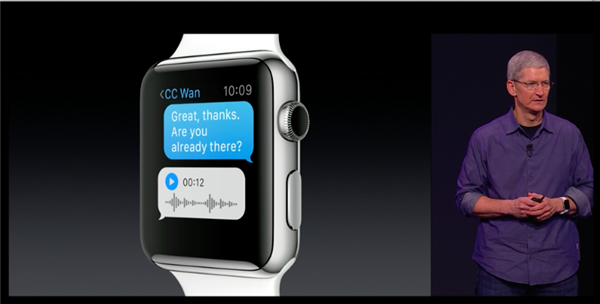 Wild... You control the Apple Watch with a clickable crown on the side. So far, no indication that it's a touchscreen, though. Cook: "It's as much about personal technology as it is about style and taste." 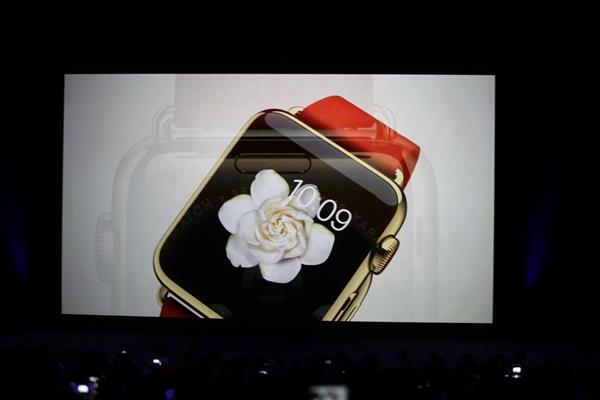 A very hip girl with a nose ring is onstage wearing the iWatch. She is so cool. Be my friend nose ring girl. And now, a Sir Jony Ive video, of course! 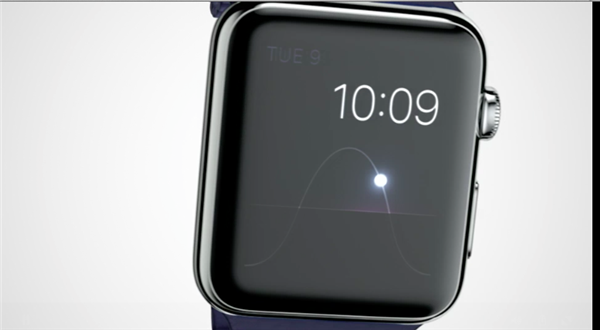 Jony Ive, Apple designer, now narrating a video about the watch. How come he's never onstage live? Doesn't he want to feel like a rockstar? Ive: "You can't determine the boundary between the physical object and the software." "It connects with the wearer at an intimate level." 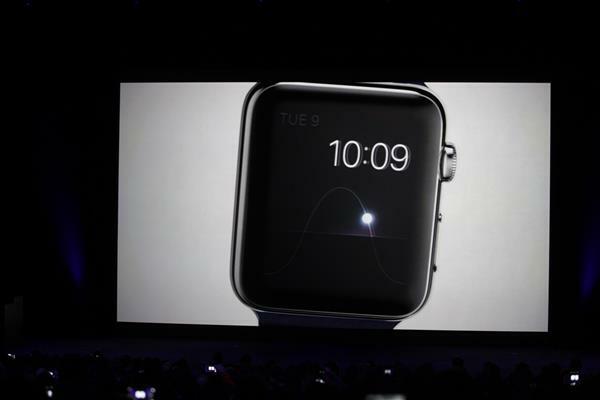 Ive: "The watch senses that you're raising your wrist and activates the display." I feel very creepy taking pics of these models but I guess this is journalism? 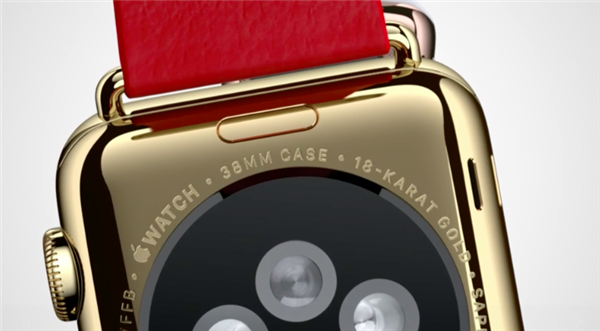 Some more details on the Apple Watch, it's water-resistant but you can't submerge it. I do, however have an Apple Employee on record saying it's safe for running through sprinklers. This WILL be tested. Does the Watch redefine wearables and finally kill off Google Glass? @SamsungFan At least Apple doesn't steal your personal information like Androids & Google do! That's a huge plus in my book. Speaking of phones being charged more than Tim Cook said: Don't buy your iPhone 6 & 6 Plus at Radio Shack. They'll just rip you off! And Wal-Mart will try to get Apple to make it out of cheaper parts. Best bet: go straight through Apple or your phone company's retail outlets! @DavidPogue/YahooTech... *crying* at U2LOUD sooo funny! It’s strongly looking like the Apple Watch is not waterproof. That’s a biggggggg problem. Now we know what's in the huge white temporary building next door: iPhones and iWatches to play with! As the iphone6 is announced, how will this affect the pricing on the 5S and 5C models? Hey guys -- thanks for tuning into our LiveBlog. I know there are still lots of questions, so come back as we're digging for the answers. Don't forget to check out the Yahoo Finance broadcast as well. 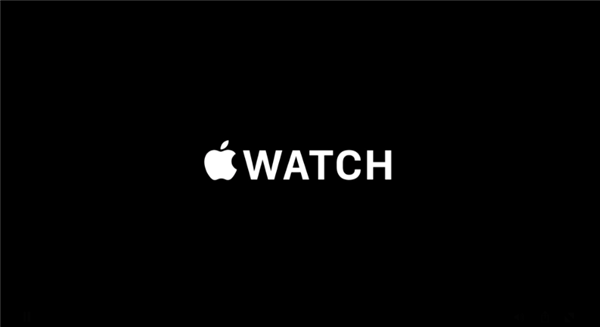 Thanks everyone for watching this Apple event along with us! Make sure to follow us on Facebook for more and check out Yahoo Tech's website for complete coverage and photos from California!